It’s that time of year when New Jersey sweethearts focus their thoughts on romance, flowers, and (last but not least) chocolate and other candy delights. We are fortunate to have several local purveyors of homemade chocolates who can help you satiate your sweetie with Valentine’s Day treats. One such chocolatier is Pam Orris, who (with her husband) owns Aunt Selma’s Chocolate and Candy Company in Mount Laurel. The story of Aunt Selma’s is a story of triumph in the face of adversity. Pam’s husband is a survivor of the 9/11 attacks on the World Trade Center. As if that wasn’t enough to deal with, both Pam and her husband were laid off from their jobs within months of each other. Pam started selling real estate in South Jersey and heard about a local candy shop that was for sale. She convinced her husband to take a giant leap and join her in becoming an entrepreneur in the spring of 2008-shortly before the economic down turn that rocked business owners everywhere. Three and a half years later, they have a booming business that encompasses sales to walk-in customers, corporate clients, mail order clients and parents seeking a great birthday party venue. When I dropped in to see Pam on a recent Saturday, Aunt Selma’s was buzzing from the squeals of delighted children who were attending a birthday party in the store. In addition to making forts, microphones and other treats out of the bountiful candy supply in their midst, the children got to take home candy bars with their own personalized wrappers. They also got to sign their names on an apron that was personalized with the birthday child’s name. Of course, since the party took place in a candy store, the partygoers received goodie bags filled with all kinds of treats. I guess they were all getting their Willy Wonka on! Pam told me that the birthday parties that she hosts are an important part of her business, and one that she particularly enjoys because they allow her to exhibit her creativity. But kids aren’t the only customers that Pam caters to. There are a plethora of candy confections that would be perfect for that special someone on Valentine’s Day. Almost all are locally made by Aunt Selma’s. Chocolate covered Oreos? Chocolate Meltaways? White chocolate bark with key lime, orange and lemon? Pam is ready to send you on your way with these treats and more. She has also been dipping chocolate covered strawberries non-stop in preparation for the big holiday. I had an opportunity to sample my way through some of the delectable treats that are featured at Aunt Selma’s when I visited the store. As far as those chocolate covered Oreos are concerned, Pam will tell you that I loved them so much that I definitely could not stop at one. I was not sure that I would like the white chocolate bark sprinkled with key lime and other citrus flavors, but they had a sweet and tart flavor that would be sure to please even the fussiest of sweet-tarts (bad pun, I know). 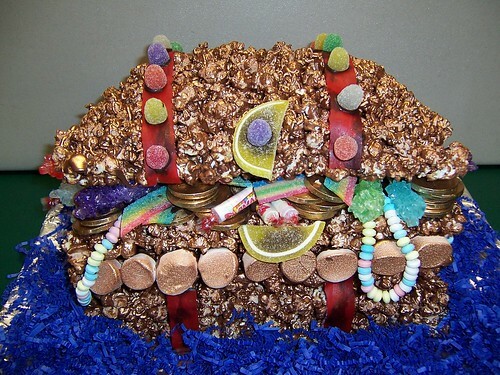 Pam uses her Fine Arts degree to concoct fanciful creations out of candy-that look almost too good to eat! Aunt Selma’s Chocolate and Candy Company is located at 451 Larchmont Boulevard in Mount Laurel. The telephone number is 856-642-6363. Not in the Mount Laurel area? Check out these other sweet suggestions. The Fudge Shoppe, 461 US Highway 202, Flemington, NJ 08822! Delicious chocolates and a great variety to choose from! According to some recent reviews on Yelp things not to miss: the chocolate covered fruit in white, milk, and dark chocolate which include chocolate bananas, strawberries, blueberries, and pineapple. Hazelnut truffle, dark chocolate covered marzipan, chocolate covered strawberries, cappuccino truffle, and of course- the fudge. Check out their Facebook page for more delicious photos. Enjou Chocolat located at 8 DeHart Street in Morristown is always one of the most mentioned by our readers. Owner Wendy Taffet says “when it comes to Enjou Chocolat…I’m doing what I was born to do.” It all started with a great passion for cooking and baking. Her first project in pharmacy school was to make chocolate syrup—perhaps suggesting her future path. Her admiration for fine desserts and chocolate coupled with the desire to create the world’s finest chocolate has led her to where she is today. A recent suggestion from a Yelper is the cocoa nib bar, orange ginger bar and chocolate cover pretzels. Jean Louise Candies 1205 Third Avenue in Spring Lake. Handmade chocolate that had one summer resident reviewer claiming this shop is always one of his first stops when he’s back in town and trumps the shops he’s tried in Manhattan. They specialize in wide variety of Chocolates, Chocolate covered Fresh Fruit, party favors as well as many other candies.